I'm as busy as anybody I know, this time of year. I need some quick and easy lunches for the family, without breaking the bank. 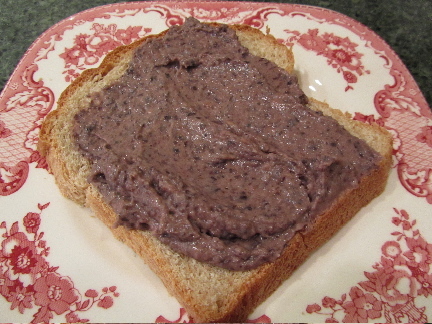 This is black bean sandwich spread on a slice of whole wheat bread. It doesn't look like much here, but it's a tasty alternative sandwich filling, and just pennies per sandwich (under 5c per 2-tablespoon serving). Last Saturday, lunch was an every man for himself affair. I set out sliced bread and a tub of this sandwich spread. We all helped ourselves. Making our own, and using simple and pre-seasoned ingredients (like the salsa), is a real time saver for me. When I have cooked beans, salsa and oil, plus a food processor, this is a cinch to make. I dump some cooked beans (I like black for this spread) into the food processor. Add some salsa and a drizzle of oil (olive or vegetable, depends on how thrifty I'm feeling in the moment). Process, taste, add more salsa or beans, as desired. I sometimes add a pinch of salt (again depending on my mood, sometimes I want it lower sodium, other times I'm in the mood for something saltier). If I'm making sandwiches for to-go lunches, I'll spread the bread with a thin layer of butter, to prevent the bread from absorbing too much water from the spread. In a pita pocket, bean spread is delicious with shredded lettuce, chopped tomato, grated cheese and/or sour cream, chopped avocado and sliced olives. This spread freezes well, so I make a large batch, divide into containers large enough to hold a week's worth of spread, and freeze until needed. Just thaw and use. We do eat a lot of beans in our house. I'm always on the hunt for new ways to use beans. Do you have any favorite ways to prepare them? We may try this this weekend. I think my family would like it. That would help me use of some of our black beans..I wonder if I throw in some garbanzo beans, how that would be?? hhmmm, will have to experiment. Thanks for the great idea. I would think the garbanzo beans would blend nicely with the black. Let me know how it tastes, if you add them. I love new ideas for beans and this fits perfectly for me...simple and cheap. Thanks for the recipe, your recipe is how I cook, a little of this, little of that till it tastes just right. I hope you enjoy it. A little of this, a little of that is how I cook most days. It does make it a challenge to tell someone else how to prepare something! I have yet to master cooking dry beans though. Following directions they are still hard so I've continued to cook and end up with mushy beans. I just need to watch my timming closely and find the perfect length for my equipment. I'll check out that link. Thanks for it. I still have trouble getting my beans just right. I need to time them better. However I have very good luck getting garbanzo beans just right. They come out nice and firm, but still cooked through. Mmmm, I love burritos. But I like to add all sort of goodies to them, beans, grilled onions and peppers, fresh salsa, rice, corn. I'm getting hungry just thinking about a burrito!